Global Four Side Flat Pouch Market size was worth at over USD 5 billion in 2017 and will surpass USD 8 billion by 2024. Low cost, light weight properties and high convenience to carry the product are the key factors fuelling the product demand. 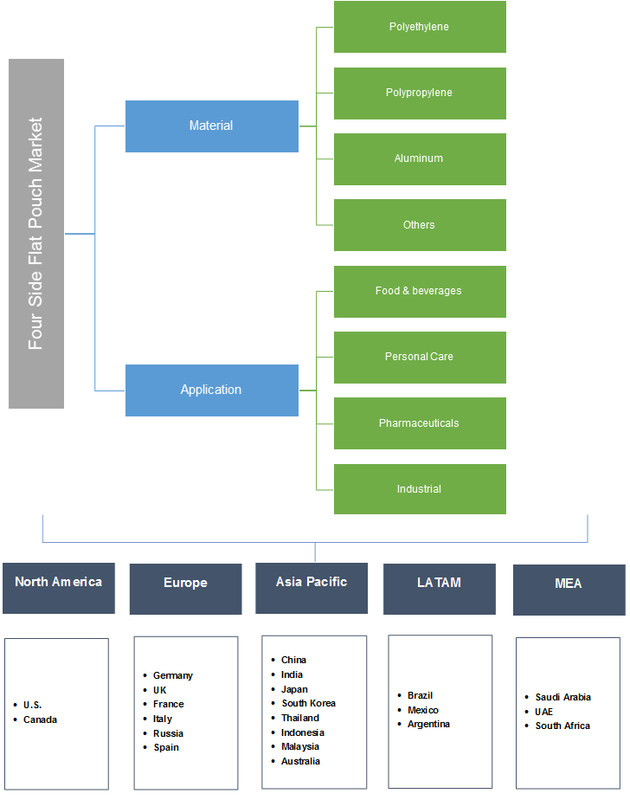 Potential applications in various industries such as industrial, food & beverages and personal care will drive the four side flat pouch market share over the forecast timeline. Growing necessity for protective packaging especially for ready to cook food has enhanced the product penetration. This can be credited to hectic schedules especially in urban areas will fuel the product demand. Changing lifestyle of the people along with rise in travelling frequencies has resulted in rising need for convenient packaging solution. Flexibility and easy to carry goods have increased the demand for the four side seal pouch packaging. Strong vacuum finish and sealing strength of the product as compared to other packaging materials are the key factors driving the industry growth. Need for attractive packages coupled with extended shelf life has further boosted the product demand over the forecast timeline. Increasing packaged food and beverages demand in developing countries is projected to enhance growth prospects for the four side flat pouch market share. In addition, rising consumer preference towards light weight packaging has driven the industry demand. The changing food habits along with inclination towards fast food will further support the business growth. With increasing technological advancements and product innovation, the design and utility of the product are anticipated to propel the four side flat pouch market size. The appearance of products sealed on all sides are more attractive as compared to other packaging products. Development in organized retail industry has lead to surge in industry growth. Shifting preference of brand owners towards convenience packing to position, differentiate and promote their product will enhance the business growth. Preferences of people for large space pouches while travelling coupled with fluctuating raw material prices for polymers are challenging the industry growth. Stringent government norms on recyclability of materials used in packaging may further restrain the industry demand. Polyethylene accounted for around 50% of the overall four side flat pouch market share in 2017. High flexibility, superior thermal & chemical resistivity along with enhanced insulation properties are among key factors driving the polyethylene demand. The lower production cost of polyethylene as compared to other plastics has encouraged the producers to prefer its use in packaging. Polypropylene material will witness gains at over 6.5% CAGR up to 2024. High heat resistance, low density, and high clarity & durability are among the key factors propelling the product demand. Increasing propylene demand due to its ability to act as a moderate barrier to gases, odours and moisture has enhanced the business growth. Food & beverage sector is anticipated to be valued at over USD 5.3 billion by 2024. Increasing packaged food and beverages demand owing to robust economic conditions has increased the product demand. Increasing use of ready to eat food has enhanced the product penetration. 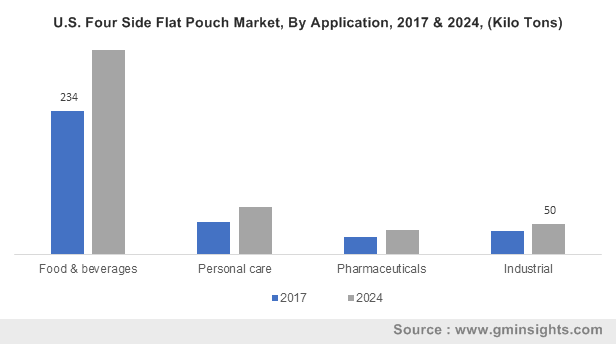 Four side flat pouch market from personal care application is anticipated to observe growth at over 7% up to 2024. Consumers tend to spend more on personal care products owing to the growing disposable income has fuelled the industry size. Increasing personal care products demand due to its various usage in hair care, skin care, make-up and oral care is driving the industry growth. Europe four side flat pouch market accounted for over 28% share in 2017. Increasing travel and tourism industry sector in Germany, Italy, UK and France has led to four side flat pouch market growth. Fast paced lifestyle coupled with increasing consumer preferences for small and convenient packages will fuel the business growth. Rapid replacement of flexible packaging over conventional metal cans and bottles mainly for detergents, baby food and pet food will support the industry growth. Asia Pacific four side flat pouch market will witness growth at over 7% over the forecast timeline. Growing population along with increasing per capita income has enhanced the product penetration. Rising demand for ready to cook food products coupled with increasing penetration of packing in urban areas will drive the product demand. Global four side flat pouch market share is highly fragmented with the presence of large number of local as well as international players. The Dow Chemical Company, Smurfit Kappa, Smart Pouches, SN German Pouches Pack Technology and Swiss Pac are among the key market players. Other industry participants include Ampac, Frain Group, Pakona, Fresco, Coffeebags.co.za and Shrunchi Packing. The manufacturers are focused on adoption of several growth and expansion strategies including mergers and acquisitions, joint ventures, supply agreements, new product launches and product portfolio expansion to improve their industry foothold. Four side flat pouch is gaining popularity due to its low price and strong sealing strength. They are completely sealed on all sides offering a uniform appearance and improved product protection. It has strong vacuum finish and sealing strength than the other pouches. These are ideal for bulk coffee packaging, gift packs and food items including smoked or dried meats. The products can be used for various products including granules, creams, liquids or powders as it offers an optimal packaging solution.